Author: Anatole Nahayo. 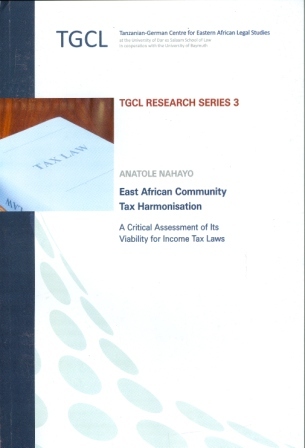 Series edited by: Tanzanian-German Centre for Eastern African Legal Studies. 20 pp. Roman, 342 pp. The research findings warn of the real danger posed by the continuing wide disparities in economic levels, economic endowments and other factors, which still lead the partner states to focus more on municipal objectives than the professed objective of integration. The study does not show this last objective to be impossible of attainment; rather, it identifies the obstacles which need to be surmounted if success is to be achieved. It recommends a re-examination of current approaches in order to avoid the challenges that have persistently dogged multilateral arrangements on taxation. It argues that the Community cannot bring about a multilateral tax regime through bilateral mechanisms. The premonition from the very beginning of the research was that to talk of harmonisation of income tax systems within the Community, instead of unification of the systems, spelt doom. In this context, therefore, this study is not only cautionary, but also rescue-based.